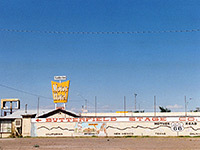 Route 66, between Chicago and Los Angeles, was named in 1926 but largely replaced by the more efficient interstate system during the 60s and 70s. In the 40 years of its existence the road became the subject of countless songs, films, books and legends yet today there are few traces remaining; large cross-country sections became part of the interstates and other stretches fell into disuse. 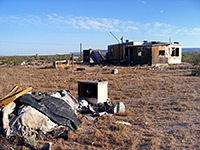 Despite this abandonment, Route 66 still forms the main street of many towns, and several long parts of the original road do survive, such as through the Mojave Desert in California and in New Mexico, alongside I-40 through such small towns as Laguna, Grants and Prewitt. 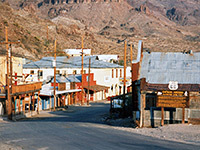 However, the best preserved and most atmospheric section in the Southwest is in Arizona, between Topock on the Colorado River and Ash Fork east of Seligman - about 165 miles in total and including the main street of Kingman, the largest town on the route. Further east, the next short stretch of original road runs through the center of Williams, another historic old town. From the tiny village of Topock on the California border, the now little-used Route 66 crosses flat desert land covered by numerous and varied cacti, then climbs into the Black Mountains close to many old mines and through two ghost towns (Goldroad and Oatman). The road's high point (Sitgreaves Pass) has great views for many miles east and west. 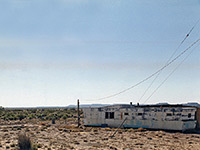 There is then a gradual descent past more Mojave Desert scenery and across the wide Sacramento Valley towards Kingman, a historic railway town. 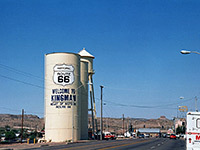 East of Kingman, Route 66 crosses varied landscapes of sand, forest and prairie for over 100 miles, through several small, peaceful towns including Peach Springs on the Hualapai Indian Reservation en route to I-40, which it joins first at Seligman and again near Ash Fork. 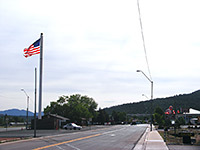 Further east, the original road has largely disappeared under the interstate, but it re-emerges briefly to form the main streets of Williams and Flagstaff.